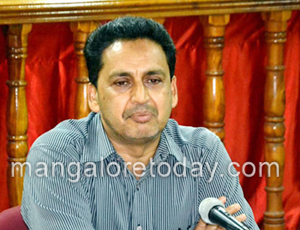 Mangaluru, Mar 26, 2015: DK Deputy Commissioner Adoor B Ibrahim declared that all major surgeries in Dakshina Kannada district under ’Vajpayee Arogyasri’ should be suspended till an inquiry into the death of an elderly woman and a child, after undergoing angioplasty and open heart surgery, at Omega Hospital in Mangaluru is completed. Giving comments after receiving memoranda from DHO Dr Ramakrishna and Karnataka Government Medical Officers Association DK unit President Dr Rajesh, condemning an attempt to assault DHO who had been to Panaje PHC following unrest on March 25, the DC said DHO should form a committee comprising Taluk Health officers, representatives from IMA and other associations to conduct a probe into the incident. He also sought post-mortem report to ascertain the cause of death. He added that he would seek reports from the hospitals where surgery was conducted. Post surgery follow up should have been as per guidelines, the hospital should ensure correct post surgical care. It may be recalled that a team of doctors from the hospital had conducted a check-up camp at Panaje PHC on March 10. The camp identified 27 persons suffering from cardiac ailments, of which nine had undergone angioplasty and a nine-year-old who had undergone open heart surgery died on the day of the surgery itself. One Poovakka, died on Mar 24 Tuesday had undergone surgery on March 13 and was discharged, on March 18. She complained of complications and hence was readmitted to a hospital in Puttur where she breathed her last. When her body was brought to Panaje PHC, locals gathered and shouted slogans against the hospital. Hearing the news of unrest in Panaje PHC, DHO Dr Ramakrishna along with District Aids Prevention and Control unit (DAPCU) Officer Dr Kishore rushed to the spot. The mob who had gathered in a fit of rage had attempted to assault DHO. The police had to resort to lathi charge to disperse the crowd. Condemning the attempt to assault DHO, all the staff of health department staged a protest by wearing black badges on March 25. The DHO said he has already brought the issue of the two deaths to the notice of Suvarna Arogya Trust Deputy Director to be brought to the notice of the Director. The Trust has been entrusted with the responsibility of implementing ’Vajpayee Arogyasri’ schemes. The Trust has been asked to send a team of experts to conduct an inquiry into the cause of death. Also one more patient who had undergone surgery has developed swelling in hand. Karnataka Government Medical Officers Association DK unit President and district Surveillance Officer Dr Rajesh said that district health and family welfare officials are not directly involved in selecting beneficiaries and conducting surgeries. Hence, there is a need to conduct an inquiry into the incident. The health department officials have the responsibility in implementing the health schemes initiated by the government. Attempt to assault an official on duty does not help in discharging duty effectively.